PicPort-Color acquires images from S-Video and Composite video sources in NTSC/RS170/PAL/CCIR/SECAM or PAL-M formats. Onboard electronics insure conservation of color information during digitalization process. LV-SDS Software Suite includes Orchid library, with ActiveX/OCX and regular function calls, Daisy C/C++ core library, Daisy Real-time Application Library, Video for Windows driver, Twain driver, and Camera Editor. 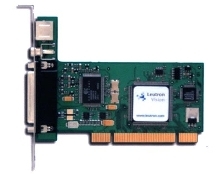 pleased to announce the release of Leutron Vision's PicPort-Color frame grabber in a Half Height PCI compatible form factor. Vision Software Development Suite) is the source of development tools for PicPort® and PicProdigy® frame grabbers. It includes Orchid (easy to use library with ActiveX/OCX and regular function calls), Daisy (C/C++ core library), Daisy Real-time Application Library (DRAL, C/C++ core library), Video for Windows driver, Twain driver and Camera Editor (camera description utility). LV-SDS runs under Windows 9x/NT/2000/Embedded, Linux (Intel based) and VxWorks (Intel based). The library offers many different ways to control the board and thus is adapted for any kind of application. With all its technical qualities, PicPort-Color comes with a low price to satisfy all budgets. acquisition. This European company has gained a solid reputation with PicPort®, their industrial low-end frame grabber series, and PentiCam®, their versatile embedded vision systems. Leutrek Vision Inc. represents Leutron Vision and distributes their product in North America along with other world-class image processing hardware and software from Atlantek Microsystems, MVTec and Teli. Leutrek Vision builds its business by offering client support, product knowledge and good selection of quality products. www.leutrek.com or call (781) 238-0213.